Psst! Hey, you -- yes, you, the one reading this. I see you there. Come closer; there's something I need to tell you. It's simply this: If you aren't taking Google+ seriously yet, you're missing out on an enormous opportunity. Go ahead -- laugh. Tell me how Google+ is a "ghost town" filled only with Google employees and/or Robert Scoble. But if you really look closely, it's getting difficult to deny that Google+ is important as a social networking arena. Research suggests it's well on its way to surpassing Facebook in terms of social sharing activity. It has a direct and significant impact on numerous other Google services, including search. And all measurements aside, those of us who have embraced Google+ have found a thriving and active community of passionate tech enthusiasts who regularly comment on posts, follow links and reshare material -- a presence that can be valuable both for personal and professional interaction. Count me among the satisfied pack that's tapped into Google+'s potential. In the two years since the service launched, G+ has become my primary "home" online -- the place where the majority of my social networking takes place. The level of engagement and quality of discussion I see on G+ are vastly superior to what I see on other social networks (especially Facebook) -- and those differences were apparent long before my G+ follower count eclipsed my totals elsewhere. Any social network has the potential to seem quiet when you first arrive. While Google+ may not be the de facto gathering place for aunts, uncles and old high school acquaintances, it is an ideal environment for finding people who actually share your professional and personal interests. "The amount of effort required to fill your stream with interesting conversation is minimal," says Fraser Cain, a space enthusiast who runs the Universe Today blog and has amassed over 800,000 followers on Google+. "Your first step is to follow people you're interested in hearing from, then after a while it seems busier and busier." 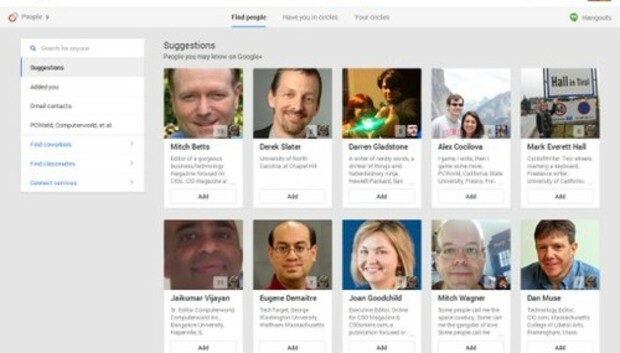 Google+ gives you a helping hand by suggesting groups of people who post about topics you like as well as people with whom you have a connection (you can always access those suggestions by navigating to the "People" section of the site). Other good ways I've found for finding folks include using the G+ search function to look for people posting about your areas of interest and browsing through the site's "What's Hot" section to unearth users who are actively sharing interesting material. And of course, you can also always search for specific experts and industry leaders -- even lowly tech writers -- who talk about your favorite subjects. Their own commentaries aside, they're likely to share and reshare content from other users that'll be relevant to you -- and you'll probably encounter other interesting people commenting on their posts. There's no magic shortcut to gaining new Google+ followers, but becoming an active participant in your niche -- whatever it may be -- really can help. Try to follow people who talk about the same sorts of things that are relevant to you and then interact on their posts whenever possible. Discussion value aside, you'd be surprised how many people will circle you when you leave insightful, interesting or funny comments in the right places (and most of those people are inherently bound to be interested in the same topics you discuss). Such interactions can also lead to your inclusion in shared circles -- personal recommendation lists that people pass along on Google+ -- as well as within the site's own internal recommendations. Another area to consider is Google+'s growing collection of communities -- organized discussion forums that revolve around specific topics. There, too, a little bit of effort can go a long way. "If there's not a community out there for what you're interested in, create your own community and invite others to join it," suggests Sarah Hill, a reporter with the Veterans United Network who's assembled 2.7 million G+ followers. "You'll surround yourself with people who are interested in what you're interested in." It may sound obvious, but taking the time to fill out your Google+ profile -- and to upload a halfway decent picture of your smiling mug -- can make a world of difference when it comes to attracting attention. The same could be said for any social network, of course, but given Google's emphasis on search and discovery, it's particularly important with Google+. "When people search for others who are passionate about a certain subject, if you don't have [the relevant terms] in your profile, Google doesn't know to include you," Hill says. A consistent identity across social networks can also be helpful, especially if you've already built a following in other places. "If a person recognizes your picture over on Twitter, they should recognize your picture on Google+, too," Cain notes. "It's super important to make it clear that you are that same person in all those different places." The same applies for a business: Google+ allows you to create professional pages for organizations that can be managed by multiple users. It helps if your company's Google+ page is immediately recognizable and consistent with the rest of your business's online presence. Figure out what you're interested in -- whether personally or professionally -- and then find interesting things to share on that subject. Whether it's science, technology or cooking, knowing your focus will help others understand what you're all about. "You want to post information that's relevant to the kind of audience you want to have interacting with you," Cain says. That doesn't mean you have to be a single-note sharer; sprinkling in the occasional "just because" post -- whether a behind-the-scenes glimpse at your work, a funny photo relevant to your area of discussion or an amusing anecdote -- can broaden your appeal and help establish you as a real person worth following. Some of my most popular Google+ posts have been random images or off-the-cuff quips that tie into my favorite geeky subjects but have no direct connection to any stories I've written. "You want a little bit of dessert with your vegetables," Hill explains. "Don't just talk about yourself all the time." Like with anything, what you get out of Google+ tends to be directly related to what you put into it. Simply pasting in URLs and clicking "Share" won't get you very far. Even when I'm essentially just passing along a link, I try to write something to go along with it -- and put some thought into what I say. You don't have to compose a novel by any means, but a sentence or two actually addressing your followers and leading them into the link makes your post more than just another ripple in the stream. "It's great that you just put a link to something, but why is it interesting to you?" Cain asks. "Custom information in a post ... gives much more emphasis than when you just post a link and move on without offering context." Google+ also provides formatting commands to help make your content pop. Surrounding a sentence with asterisks, for instance, causes the text to be bold; many G+ enthusiasts use that as a way to create an eye-catching title at the start of a post. Last but not least, posts with large images or video often do well on Google+. The service is a visual medium, after all, and everyone loves eye candy. Even if you're posting a link to something, occasionally including a picture within the post can change things up and catch content-surfers' eyes. The Hangouts element of Google+ is arguably the service's killer feature -- and it can be a powerful weapon for anyone looking to build a following of like-minded individuals. CircleCount: This service provides a wide range of statistics on your G+ account, including which of your posts have gotten the most activity (broken down by factors such as day of the week and time of day) and how your follower count has fluctuated over time. Public Circles: Put your 21-digit G+ ID -- the number at the end of your G+ profile's URL -- into this site to get a list of recent publicly shared circles in which you've been included. SocialStatistics: Add your account to this service to see a complete breakdown of your week-to-week follower count and how it compares to other G+ users. Hangouts lets you have one-on-one or group conversations via video and -- if you're so inclined -- share the video to your stream live or as an after-the-fact broadcast. Sarah Hill uses Hangouts to host interviews with people relevant to her field as well as to hold Q&A-style discussions with her followers. "We're interacting with people face to face, not just chatting with their avatars," she says. "It's a deeper level of real-time engagement." Sessions don't have to be limited to talking heads, either: Fraser Cain caught Google's attention with his creative use of Hangouts as a method for hosting "virtual star parties" -- public gatherings where amateur astronomers from around the world share views from their telescopes via their webcams. Cain starts the parties and shares them from his personal Google+ account. "I wanted to demonstrate that this service would be really useful for astronomy and give some value to the people who are interested in this topic," he says. Cain has certainly succeeded at that goal -- and has simultaneously managed to deliver some value to himself as well. "There are all these intangible benefits you get," he says -- things like brand reinforcement and establishing one's reputation as an authority in a field. "And bar none, it's provided a platform for the most interesting conversations I've had anywhere." And that, my friends, is what we call a plus.